The Immigration and Customs Enforcement agency is receiving more taxpayer funds even as it expels fewer illegal immigrants, according to statistics published by the Department of Homeland Security showing that 43 percent fewer aliens were removed from the United States from 2012 to 2015. ICE deported nearly 410,000 aliens in 2012 when it received roughly $2.8 billion in taxpayer funds. In 2015, the agency expelled just 235,413 aliens but received around $3.5 billion to fund its deportation programs, according to the DHS statistics. 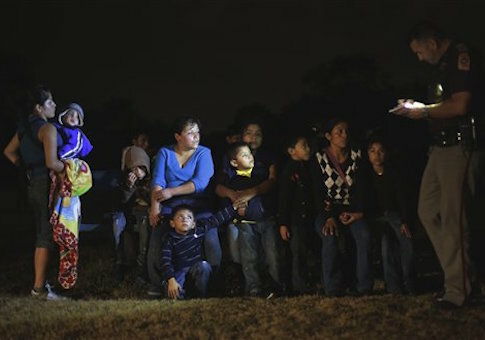 Deportations dropped by 174,436 over the past three years despite an increase in funding totaling more than $680 million, according to statistics highlighted Monday by the Senate subcommittee on immigration and the national interest. In total, ICE was shown to have received around $3,901 more in funding for each illegal immigrant it failed to deport over the years. "Deportations of aliens from the United States have decreased precipitously under the Obama administration—particularly of those aliens from the interior of the United States," according to subcommittee sources that discussed the statistics in an email to reporters. "ICE removed nearly 43 percent fewer total aliens from the United States in FY 2015 than it did in FY 2012—and nearly 62 percent fewer aliens from the interior of the United States," according to the subcommittee, which attributed the decrease to policies put in place by the Obama administration. 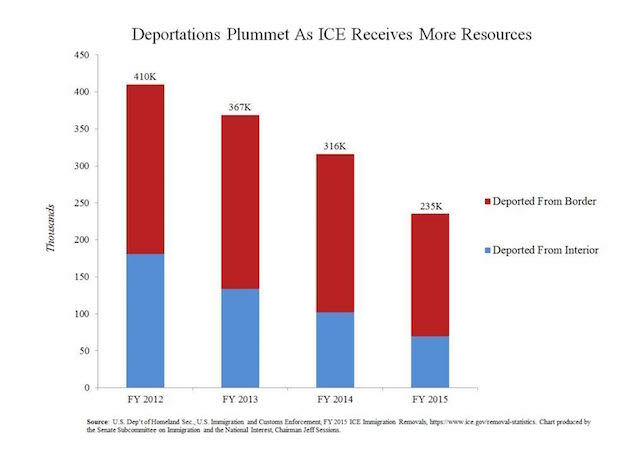 "This dramatic decline in deportations is the direct result of policies implemented by the Obama administration to get around plain law passed by Congress," according to the subcommittee. Senior Obama administration officials have warned that ICE only has the financial resources to deport around 400,000 aliens a year, which amounts to less than four percent of the total estimated illegal immigrant population residing in the United States. However, ICE has received substantially more financial resources in recent years for its deportation programs. At least $113 million was shifted by the Obama administration from ICE’s budget and reallocated to programs aimed at detaining and removing illegals. "While ICE's detention and removal budget grew approximately 25 percent from FY 2012 to FY 2015, the total number of aliens it deported from the United States decreased by nearly 43 percent," according to the subcommittee. "ICE removed 235,390 criminal aliens from the United States in FY 2012, as compared with 139,368 in FY 2015—meaning that it deported nearly 41 percent fewer criminal aliens last year with 25 percent more resources than it had in FY 2012," the subcommittee wrote. This entry was posted in Issues and tagged Illegal Immigration, Immigration. Bookmark the permalink.